In an interview with Fox Sports Australia, Raw General Manager Kurt Angle has once again discussed about his wish to step back in the WWE ring and wrestle rather than just be an on-screen GM. Angle said that he feels great but he needs to be patient and see how this whole thing is going to work out. The Olympic gold medalist has not underwent any physicals to determine if WWE docs could medically clear him, however, he told Fox Sports that he is indeed getting drug tested. “I haven’t taken the physical to wrestle but the drug testing…I’m part of that. I’m a talent on TV. 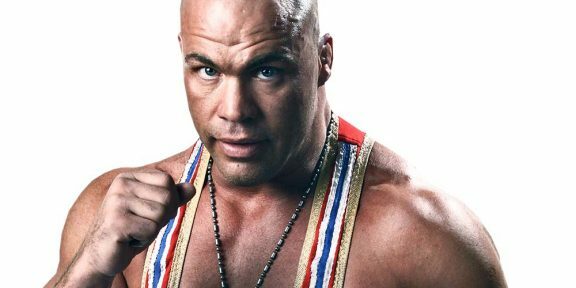 Although they don’t treat me as a wrestler, if you’re a talent, you’re involved in everything,” Angle said. Kurt also said that the decision of him wrestling or not basically is up to Vince McMahon. “I would say I will most likely wrestle. It’s up to Vince McMahon. I would imagine I will,” Angle concluded.